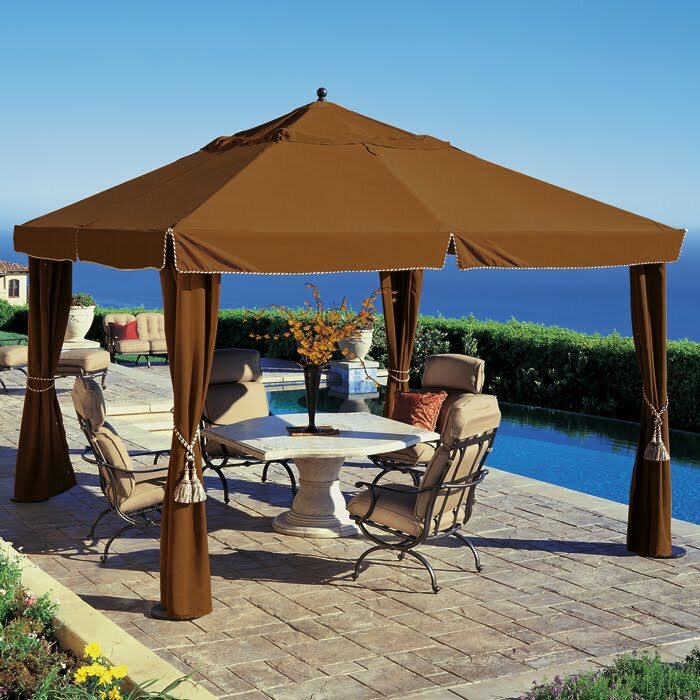 Our backyard tent pavilion has brought many hours of enjoyment over the years. We bought it in 2003 and created this outdoor room. In the summer, we sit here at night with candles lit, listening to the fountain and drinking our glass of wine. One of the advantages of tents is that they can be moved. I have set this tent up in the backyard of a house I staged for a kitchen tour. I even put it on the lawn for an evening dinner party. Wherever it goes, it creates romance and adds an instant sense of place. Here it is set up for my girlfriend's 50th birthday party. And here it is today looking tired. I made the mistake of not taking it down and storing it in the garage for two winters in a row. Consequently, there is moss growing on top and the teak wood is turning black. The inside structure is sagging. The big question is do I replace it or try to restore it? I made a phone call to the store where I bought it. It is made my Tropitone and at the time was expensive. I should have taken better care of it because the price has gone up $1000! Here is my same tent on Tropitone's website. I'm loving those striped side curtains! I decided to do some homework and see if within the last seven years, there are more options from other manufacturers. This is another tent by Tropitone which is less expensive because it has metal framework instead of teak. All of their tents are made with Sunbrella fabric. 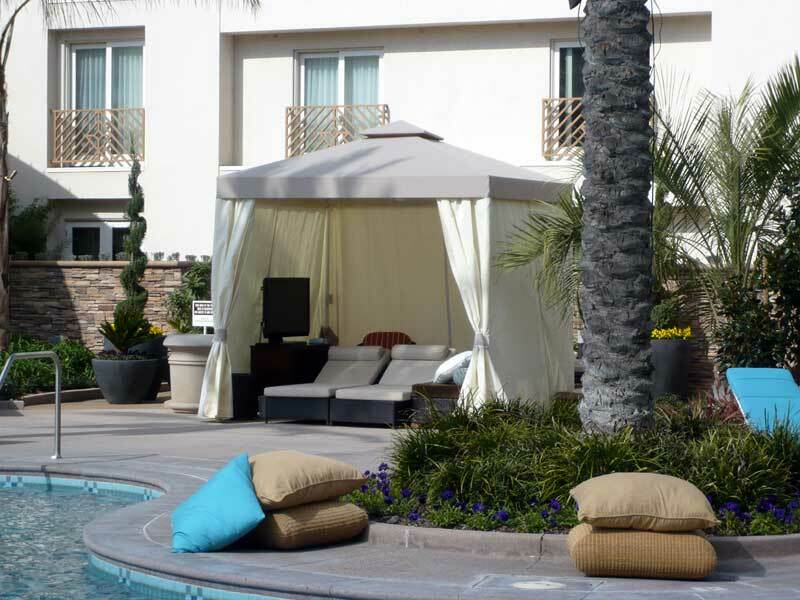 Here is a poolside pavilion from Resort Cabanas, a company specializing in cabanas for hotels and resorts. Not quite the look I'm going for. Now this is the look I'm going for! I found this image from Traditional Home and fell in love with this outdoor room. I'm wondering if the homeowner takes this tent down in the winter. Isn't it wonderful? I found this pavilion from Target! It is the most expensive of all their backyard tents, but quite a bit less than the Tropitone tent. The posts are metal and I don't believe the fabric is Sunbrella, but for the price, it's very nice. Although it is too dark for the look I like, I could paint the posts white.....What do you think? These tents are from Maharaja Tent Company. The top one is called the Lily Pond Cottage Tent and the bottom one, my favorite, is called the Pergola Tent. How romantic are they? Or this? Somehow, the tent "makes" this backyard, even though it is already magnificent. I'm linking up to A Southern Daydreamer for Outdoor Wednesday. Thank you Susan for hosting. How pretty your outdoor room is! I love the one from Target, but I agree that yours could be restored with a little elbow grease. Can't wait to see it all done and ready for summer! I would also try to have the tent repaired. Its really lovely and you love it, now your could say its vintage with the mold on it LOL. My husband left our Red canvas umbrella out all winter and it has faded. I will have to purchase a few new ones for the new back yard. Our pool is lagoon style and has a hole for a umbrella to be put into the water. I need to find one that has a plastic pool. That's on my to-do-list. Thank you for the paint tips. I picked up the paint color samples at ACE over the weekend. You are so blessed with such a gorgerous home and a fantastic place to live!! My husband loves California and would love to live there. It is lovely you can eat outdoors, and it looks beautiful. We have TV shows creating outdoor areas, but the reality is we have too many flies and in the twilight mosquitos and bugs, to enjoy an unscreened outdoor area. I would attempt to restore it first too! You have such a magnificent area to enjoy this it is well worth the effort! Our umbrella is starting to show it's age and fading but is still hanging in there although it will need replacing before too long. Just work your magic and see if you can buy yourself another year! It's still really beautiful as it is right now! Yep, I'm about 80% back. my husband and I spent 4 hours last night and seem to have figured out the problem, we think...I still see "obsolete feed" on some site's blog rolls. Don't have a clue what the deal is but I'm carrying on...what else can I do? Give up blogging? NEVER!!! Okay, about your tent, which I love by the way. I was looking on line at replacement gazebos - there were a lot of replacement fabric liners and such for just your type of set up. You might just replace the fabric and restore the frame you have for much less than getting the whole thing new. I saw the one at KMart, it's nice but probably not as sturdy as what you have now. For $500 you could probably get quite a few more years out of yours. Whatever you decide to do I agree with you that it sets a mood and it's really lovely to sit under one on a warm summer's eve! And summer is right around the corner, can you believe it? Also many thanks for all your support during this ridiculous blogging trauma! You are a true BFF!! Definitely try to repair yours, it's beautiful. But I do have to say that the Target tent with a good coat of paint would rock! I love them all! I really love yours the best..the furniture is so pretty! Hope you can get yours repaired for a fair price! Beautiful settings! Hope you can get yours restored. I had hoped to upgrade a few things in my courtyard this Spring, but other things took center stage. What a cool outdoor space. It's certainly worth trying to bring yours back, but if that doesn't work, there are so many choices. Just lovely. We here in the East would never consider leaving it out all winter, but I can well understand how you would in your climate. I love the nice shady area your pavillion creates. Hopefully you can restore it to it's former beauty. I can't choose a favorite. I would have a glass of wine and some lovely Brie under any one of those canopies. 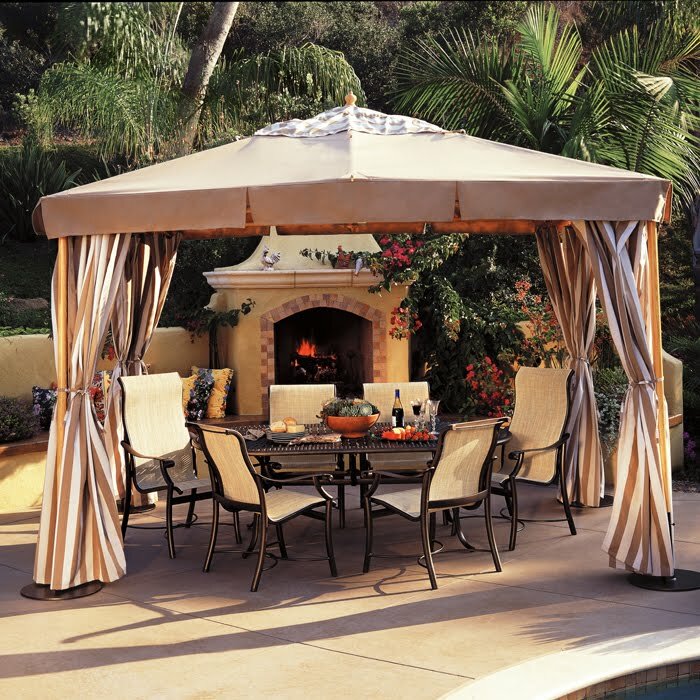 Fantastic backyard tent AND your outdoor furniture is beautiful too! I would try and restore the one you have... its worth it! Your tak can be oiled, by hand, with teak oil and it will look like new... And a good upholster can take the tent pices and make a pattern and re do the fabric using Sunbrella. I just bought some Sunbrella fabric and am having my outdoor cushions re-made. The fabric was about $20.00 yard but is worth every penny! Other companies make outdoor fabric too. Even Tommy Bahama makes outdoor fabric! Beautiful tent pics. Maybe you can pick out some Sunbrella fabric, take it to a seamstress and have it re-done. It looked great in the pics. Did I say it was beautiful setting? Well, it's that too. How lovely! You are blessed to be able to keep such a beautiful setting in your yard. Where I live...up in the mountains...such a tent would blow over to the neighbors in a wee moment! It is soo windy here! It looks like you have some wonderful options...but I think a little moss just adds more character. We've had a tent in years past. I love outdoor rooms. We bought an awning this year that retracts. I saw a lovely tent room at one of the super hardware stores with a wrought iron frame. You've done such a good job decorating yours. Perhaps it will be alright. I'm so glad you decided to restore yours, just think of all the memories attached to it. I'm very sentimental about such things, lol. I do love the one from Traditional Home, with all the fab decor, very much my style, but doesn't match my pocketbook. I used to have one made of Sunbrella fabric and loved it. I too, left mine out and an unexpected tropical storm in Florida led to its demise. So restore and store (in Winter) my new friend. We had the one from Target at our last house. We took everything down the first year when the weather turned. Put it back up in the spring, no problem. Next year we stored the fabric in the same shed and mice got to it! We were able to buy replacement parts at Oudoorpatio.com (I think that's it). It was very sturdy and well made and we loved it. I think with some research you will be able to restore yours. They really add a nice touch to the outdoors. Best of luck with it!